Water quality will play a significant role in how your water ionizer – in fact any water ionizer – performs and its longevity. A water ionizer requires mineral content to create those valued ionizations/ alterations in pH, ORP and to also produce molecular hydrogen H2 in water. Minerals are not only required, they are good. Calcium, potassium and magnesium all naturally occur in water and are called the “essential alkalizing minerals” because they are essential to our health. The minerals in water are conductive. Conductivity allows for the electrical charge that produces the alterations we are seeking in alkaline, ionized water. Minerals provide a certain “vitality” to water. Water that lacks mineral content, such as water from reverse osmosis or distillation, as no conductivity and is considered by many to be “dead” or denatured water. It is important to note that all water found in nature has some level of dissolved mineral content, so these types of “pure” waters are literally a man-made phenomenon. Our bodies are designed to drink water with minerals, to use calcium for bones and magnesium for the heart etc. and mankind has been doing so since the dawn of time. It is only in the last few decades, that we have been exposed to pure and mineral free water – often in bottles. The more mineral content your water has, the more easily your water ionizer will alter/ionize the water and the better water ionization performance(pH,OR, H2) it will achieve and conversely. Water with a high level of mineral content is called hard water, while water with a low mineral content is called soft water. That stated, all AlkaViva water ionizers will produce an ideal range of healthy drinking water, in both hard and soft water areas, unless used in extreme water quality situations. Please contact AlkaViva Technical Support if your water is unusually hard or soft as you will probably need pretreatment (more details below). If you live in a hard water area, perhaps you have noticed mineral deposits on your dishes and hot water kettle, or rings of insoluble soap scum in your bathtub. These are signs of hard water. Hard water is water that contains high levels of scaling calcium, iron or magnesium mineral ions. These minerals do not pose any health threat, unless in very high amounts, but they can engage in reactions that leave deposits or scale that may damage surfaces or appliances. Hard water mineral deposits or “scaling”, is the precipitation of minerals which form lime scale. Scale can clog pipes and can decrease the life of virtually all appliances in the home, especially those that use hot water. Scale can do the same thing to your water ionizer, decreasing water flow, water ionization performance and longevity of the water ionizer . A water ionizer requires mineral content to operate because minerals conduct electrical charge that produces the alterations found in ionized water. Water that has little or no minerals has no pathway for the electrolysis or “ionization” to occur. water Ionizers are designed to perform optimally within a specific range of mineral content in the source water; too many minerals may damage any water ionizer, too few you may experience decreased water ionization performance. With the right range of conductive minerals your water ionizer will easily alter the water and produce expected water ionization performance measurements in H2, pH and ORP. water Hardness 251 ppm – 425 ppm = Ultra Spartan Hard Water Filter. water Hardness 425+ ppm = AlkaViva Reverse /Osmosys System w/ Remineralizer or please contact AlkaViva Technical Support for additional information. Hardness (or Calcium Carbonate) over 150 ppm (8.5 grains). TDS below 40ppm or over 600ppm. Note: some reports will show “ppm” some will show “mg/l” – they are the same. Knowingly operating your water ionizer above these levels may void your warranty and/or decrease your water ionizer’s performance. In no event shall AlkaViva or its dealers be liable for any direct, indirect, incidental or special consequential damages to property whatsoever, arising from use of its products with improperly treated or untreated hard water. Many water ionizer companies will sell you an expensive water ionizer and never mention hard water. If you live in an area that has hard water, that is like throwing money down the drain! To properly protect the investment you’ve made in your ionizer, and ensure you get the right pre-treatment at a great price, we are proud to offer our AquaSafe Water Quality Assurance Program. Hard Water Test Kit. Each AlkaViva water ionizer / H2 Generator includes a highly effective Hard Water Test Kit. The kit includes a simple-to-use hard water test strip which in less than a minute will determine how hard your water is (if at all). The test results fall in ranges of hardness. We include our recommended pre-treatment solution for each range. Bypass the system (if the source water meets the above Water Quality criteria). Change the plumbing connectors and install the water softener on the hot water only. Install a Reverse Osmosis water prefiltration unit and water ionizer Remineralization Cartridge. The Reverse Osmosis will take out the sodium or potassium while the remineralizing cartridge will add healthy minerals back into the water. Bypass the reverse osmosys prefiltration system (if the source water meets the below Water Quality Tolerances). Install an AlkaViva Remineralization Cartridge after the ReverseOsmosys system (an easy solution). Soft water is very low in mineral and dissolved solid content which gives water its conductivity. Such water would have a TDS below 40 ppm. In areas with extremely soft water (or if using a rainwater catchment system), it may not be possible to achieve optimal water ionization performance of your AlkaViva water ionizer. In this situation, an AlkaViva Remineralization Cartridge is recommended. AlkaViva has incorporated a proprietary blend of 70+ organic and inorganic minerals into its Remineralizing Cartridge. The quality of well water can vary greatly and pose some health risks if not tested and mitigated. Well water needs to be tested before using with a water ionizer. Most wells are perfectly suitable for water ionizer operation; you just don’t want to be on the wrong side of that equation unwittingly. The use of well water poses a number of questions when considering use of a water ionizer. In addition to measurements of water quality for water ionization performance and durability /longevity, health safety related issues are also important considerations when using well water. Recommendation: Many states require a well water test report in the closing documents of a home sale. Many local governmental Health Agencies offer free testing of well water. We recommend contacting them first. AlkaViva offers at a discounted price a Professional Water Test done in a certified laboratory. More details here. 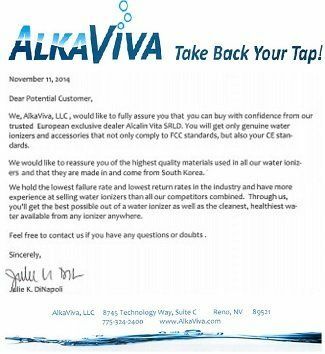 Please contact AlkaViva if your water falls into any one of the above categories. If your situation requires additional technical assistance, AlkaViva Technical Support will work with you to find a happy solution. If your water is within 10% of two or more of the Extreme Hardness categories, you could possibly experience performance issues with your water ionizer. You may require pretreatment. Please contact Technical Support for guidance. If you are uncertain of the water quality in your area, please contact your local water supplier and request the specific Water Quality information above. The appropriate phone number will be on your water bill. If using well water, contact your county or state health department to inquire about water testing services.